JERUSALEM, Israel – Israeli archaeologists have uncovered a unique link between the Jerusalem of 2,000 years ago and today. They exposed the oldest inscription ever found of the modern Hebrew spelling and pronunciation of "Jerusalem." 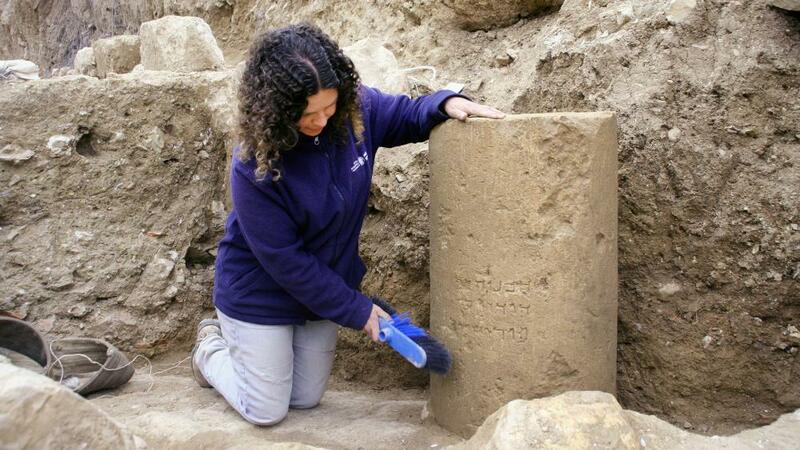 During a pre-construction dig last winter for a new road, the team uncovered a pillar with the inscription near the entrance to Jerusalem. The inscribed pillar is part of a new exhibit featuring unique artifacts from the capital at the Israel Museum's Second Temple gallery. It's the newest treasure from the time of Jesus in the exhibit. The inscription reads, Hananiah bar Dodalos m'Yerushalayim – Hananiah, the son of Dodalos, from Jerusalem. Dudi Mevorach is senior curator of Hellenistic, Roman and Byzantine Archaeology at the Israel Museum in Jerusalem. "Jerusalem surprisingly for us is inscribed the same way we write it today and the same way we pronounce it today: Yerushalayim," Mevorach told CBN News. "It's the first time we have an inscription of this sort from 2,000 years ago, from the times of the Second Temple Period." According to Mevorach, the name Yerushalayim exists on coins from the great Jewish revolt against the Romans in 70 AD, but those coins would have had a political agenda. "Here, there is no agenda," Mevorach said. "It's just an artisan from a potter's village, stating his name, his father's name and stating that he is not from the village but originally he comes from the big city, from Yerushalayim, Jerusalem." Israel Antiquities Authority archaeologist Danit Levy is in charge of the excavation. "The site was a pottery workshop that started to develop at the end of the second century before Christ…and continued to the Roman period second century after Christ," Levy explained. During the excavations, workers exposed the foundations of a Roman structure supported by columns. One of them was the pillar the Romans had reused. It bore an Aramaic inscription in Hebrew letters typical of the time of Herod the Great. "I saw the column with the inscription. It wasn't clean but I could recognize some letters and I saw that it's in Hebrew," Levy told CBN News about the day of the discovery. "I was really excited. My heart went so fast and I think all the people that [were] around me could hear it. It was really exciting because I didn't expect [it]," she said. The site is about 4-1/2 miles from the Old City, which would have been Jerusalem of that time. "So we now know in a very simple manner that Yerushalayim, Jerusalem, was called Shalem, Yerushalem, and Yerushalayim at the same time, which we didn't know before," Mevorach said of the discovery. "It's just another piece of the mosaic of how we portray the past."